After so many years and amazing achievements playing for Chicago’s northside team, The Cubs, many people forget that “Slammin’ Sammy Sosa also played for the Windy City’s southside squad from 1989-1992. 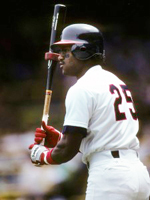 It was during his first stint in America’s second city that Sosa achieved the amazing feat of hitting two home runs on the same Opening Day on March 31, 1991. Sammy and his White Sox teammates spoiled what should have been a festive final Home Opener at Baltimore’s nostalgic Memorial Stadium by clipping the Oriole’s wings 9-1. 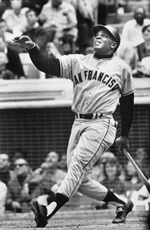 Just one month shy of his 40th birthday, Willie Mays hit homer number 629 on the first pitch he saw on Opening Day April 6, 1971, to lead the Giants over the Padres 4–0 Giants. Mays hit seven Opening Day home runs, but this one late in his Hall-of-Fame career was perhaps the most memorable because it marked the start of a historic streak. Following the Opener, Mays went on to hit home runs in each of the Giants’ next three games, setting a MLB record of homering in four straight games to open a season. When 19 year-old Ken Griffey, Jr. reported to Seattle’s spring training camp in 1989, conventional logic said he had little-or-no chance of making the team. But after 20 pre-season games it became evident that he wasn't just the best player on the Mariners’ team, he was the best player in the league that spring. After making the opening day roster, he continued to impress…especially on Opening Day 1989, when on his first at-bat at the Seattle Kingdome, he hit a home run on the first pitch he saw from the White Sox's Eric King. Griffey went on to hit 16 home runs that season -- in baseball history, only Tony Conigliaro and Mel Ott hit more homers as teenagers.